Change the Way You See the World. Welcome to Crews LASIK & Cataract Center! Are you unhappy with the current state of your vision and would like to know more about modern corrective options? Modern LASIK techniques have helped thousands of people across the country achieve better vision, without the hassle of having to wear glasses or contacts. We’d love to answer your questions and offer you a screening to see if LASIK is right for you. Our normal business hours are Mon-Fri, 8:30AM-5:00PM. Which Type of Eye Surgery is Best For You? 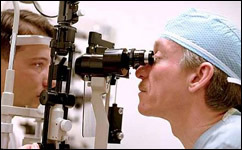 The type of surgery depends on your individual eyes and differs from person to person. Dr. Crews is an expert LASIK eye surgeon and has been helping people in Vancouver, Washington; and Portland & Central Oregon choose the best technology for their specific needs for over 20 years. LASIK, or Laser-Assisted In-Situ Keratomileusis, is an FDA-approved refractive procedure that is performed on nearly 1 million patients each year. LASIK surgery corrects nearsightedness (myopia), farsightedness (hyperopia), and astigmatism by permanently changing the shape of the cornea, increasing focusing power and improving vision. LASIK surgery is one of the most common vision correction procedures. It is designed to reduce your dependency on glasses and contact lenses. Wavescan technology captures unique imperfections in each individuals vision that could not have been measured before. This new level of measurement provides 25 times more precision than measurements using standard methods for glasses and contact lenses. Wavescan technology produces a detailed map of the eye much like a fingerprint, no two are alike. Your treatment information is then transferred to the Visx Star S4 laser providing a new level of precision and accuracy. PRK is a refractive eye surgery similar to LASIK in that both procedures are performed using the Excimer laser and is used to treat myopia (nearsightedness), hyperopia (farsightedness), or astigmatism. PRK does not involve creation of a corneal flap utilizing the microkeratome, instead, Dr. Crews will gently remove the surface corneal cells (epithelium) and proceed with the laser aspect of the procedure. Crews LASIK & Cataract Center was founded by Stanley L. Crews, one of the first laser eye surgeons to perform LASIK surgery in the Pacific Northwest. He has dedicated his professional life exclusively to vision correction techniques including LASIK, PRK, Wavefront Guided Laser Treatments and new technology IOLs for the correction of Presbyopia. Dr. Crews is one of the Pacific Northwest’s most highly trained LASIK eye surgeons delivering excellent results to his patients in Vancouver, Washington; Portland & Central Oregon and has performed over 20,000 procedures. Dr. Crews studied in Florida and received his medical degree from the University of Miami and completed his Ophthalmology training at the University of Washington in Seattle. He is Board Certified and is an active and participating member of the American Society of Cataract and Refractive Surgery. We would love to answer any questions you have about the LASIK procedure and if it is right for you. Who's a Good Candidate for LASIK? Read Our Patients Reviews | 170+ and Counting! I am so very happy with my experience at Crews! My lasik surgery went perfect. It was painless and fast....All the staff were so kind and wonderful! And I can SEE!!! Thank you Dr. Crews! I had my follow up this morning and am now seeing 20/20 after my lasik procedure yesterday. Dr. Crews and the staff are very friendly. professional, and informative. I highly recommend them. This place and staff are the absolute BEST!! I had the LASIK procedure done and I’m doing well, living a better quality of life without glasses or contacts! I highly recommend Dr. Crews and his staff. Call us at 800-757-3525 with any questions you have or to schedule your LASIK screening. Our office hours are Mon-Fri: 8:30AM-5:00PM. You can also email us or fill out our contact form and we will get back to you with 24 hours.